I've been thinking about making a sprite editor for a while now. 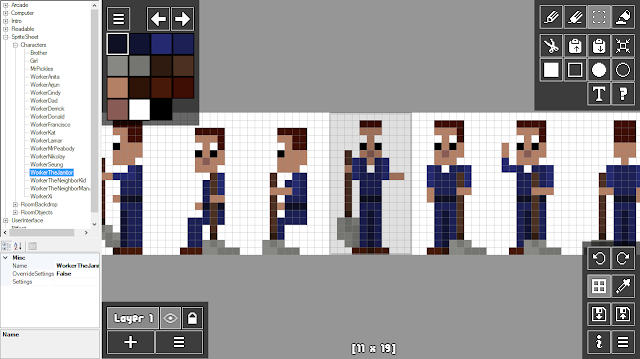 Drawing sprites is a big part of what we do when making our games. We have been using GIMP as our primary drawing tool, and while it works pretty well, it doesn't mesh perfectly with our workflow. 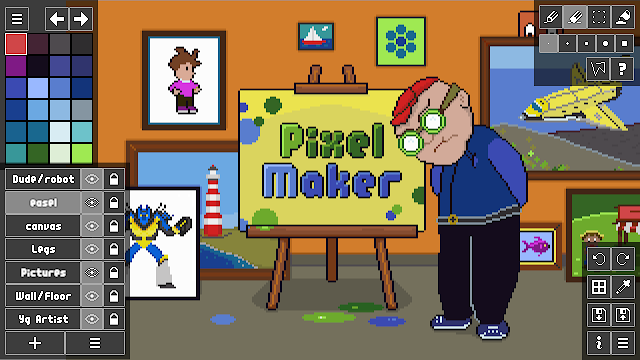 So, a few months ago I finally pulled the trigger and started working on PixelMaker. In order to justify making a polished program (instead of a rough-and-ready developer tool), we plan to release it on various platforms - initially on Wii U (the GamePad and stylus are great for drawing) and then later on mobile/PC. Our initial feature set for release targets drawing individual pixel art pieces, but future planning includes frame-based animation. We plan to get back to working on our already-well-in-progress next game soon, now switching over to using PixelMaker as our core art creation and management tool. What next game is that? Well, stay tuned for more on that soon! So, In Wii U, you can paint but not program, isn't it? Yes - it is strictly a drawing program on Wii U. We just happen to also be using it as a tool for making our games. I'm pretty intersted to pick this up. Am I able to export the sprites I create to an SD card? SD card export is not currently supported, but it is definitely something we are looking at for a future update. The ultra low price on the eShop made me purchase this. Wasn't expecting much but boy was I wrong. There are plenty drawing tools I bought on iPad and Wii U but this one just works in accordance to how I think and work. It appears to me now that I am stuck in the dPaint (great Amiga program) way of doing things. I'm instantly at home with these drawing tools and using a stylus instead of a mouse? Magic! Already mentioned on Miiverse, but you guys made a really great tool. SD card export would be really awesome. Already looking forward for it. Right now I'm in the middle of copying my workpalette into PixelMaker. Really a buttload of work, but I think it'll be worth it. Though if it would be possible someday to import or share custom palettes (dunno, maybe by fetching 8bit png from URLs? Dunno what's possible or feasible) that would be pretty cool too. BTW what's the actual max palette size anyway? Well, thanks for this tool and keep up the great work! Thanks for the feedback! I can see how creating a large custom palette would be a pain. If we can find a way to allow importing, we will definitely consider it. Regarding palette size - you can have as many colors as you like.